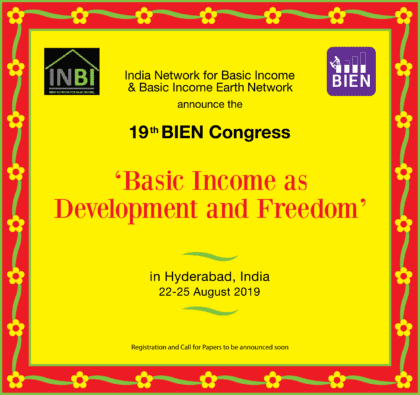 India Network for Basic Income (INBI) will host the 19th BIEN Congress in Hyderabad, India, from 22nd to 25th of August 2019. At a time when the welfare state is undergoing major crisis, all around the world, and the discussion around basic income is gaining traction, it is ever more important to give voice to speakers and participants to present and debate this crucial new approach to social security. Being an international Congress, participants and speakers will be coming from different parts of the world, which only adds to the diversity of views and opinions a real global debate like the one referred above needs. Last year’s 18th BIEN Congress was held in Tampere, Finland, organized by the local BIEN affiliate. The Congress organization results from a partnership between INBI and the NALSAR University of Law, which will house the Congress in its state-of-the-art campus on the outskirts of Hyderabad. INBI is also partnering with SEWA Madhya Pradesh, one of the largest membership-based women’s organization in the world and which played a key role in the Madhya Pradesh basic income pilot study. With SEWA, INBI will be producing short films and planning several campaign events in Madhya Pradesh and other parts of the country in the run up for the Congress. The days running up to the Congress will also host a major Hackathon in Hyderabad, organized by another INBI’s partner organization, the WisoCoLab. This event will also feature discussions around basic income and will feed in the Congress with a sum of its activities. Finally, the Mustardseed Trust is also partnering with INBI, as a financial supporter to the Congress, and in presenting a session at the Congress under “Basic Income and Caring Economy”. The Congress itself will have plenary sessions, dynamic plenaries (panel of experts, with a moderator) and parallel sessions, in a structure similar to other BIEN Congresses. As in the latest Congress in Finland, there will also be a basic income short film festival integrated into to program schedule. New features planned are the BIEN Civic Forum, and the Basic Income Ideas Bazaar. The former, happening in the 22nd of August, intends to bring together different stakeholders in a given national or regional context to share views and debate basic income. The idea is to bring together policy-makers, corporate leaders and academics at the highest levels in the Indian context so as to strengthen the basic income debate in India. The latter is a space where organizations, artists and groups working on basic income who wish to showcase their work can do so at a nominal cost. A formal Call for Papers to the Congress will soon be released. André Coelho has written 268 articles. Do you know when the call will be released, or at least when is the deadline for the submission of papers? Are you aware of similar calls that are currently active or will be in the next few months? The answers to your questions can be found here.